Time for BJP and PM Modi to introspect! By Satyen Mohapatra: The tense days are over. The election results are out. BJP’s Vijay Rath seems to be slowly grinding to a halt. Their call for “Congress Mukt Bharat” seems to be having not many takers anymore. To lose three important states in the Hindi heartland and that too to the Congress, should be an eye opener to the BJP. There seems to be a serious disconnect between the party and the people, which must be immediately addressed. Also that it is too early to write the epitaph of Congress. You cannot say that state elections are fought on local issues and central leadership are not responsible. Modi had been successful in selling his vision of India in 2014. A corruption free India, employment to 2 crore youth every year, price rise under check and several measures for the benefit of agriculturists. Indian people overwhelmingly supported him all across the length and breadth of the country. A resurgent Congress party under the overall leadership of Rahul Gandhi was able to point out to the people four years down the line that BJP had miserably failed in fulfilling its promises. Farmers’ discontent and distress, price rise, Opposition onslaught in Rafael deal, large scale unemployment, demonetization and GST which ruined small businesses and seriously affected Indian economy, were all highlighted. These issues seem to have resonated with the public and they just moved away from the BJP. The voting was clearly negative or anti-BJP rather than pro-Congress which must worry BJP top brass because it is within few years disenchantment seems to be setting in. The timing is worst because 2019 General elections are just few months away. The expectations of the people had been raised very high when Modi led BJP government took over, but naturally it was nearly impossible to deliver all that was promised at the grass roots. To be fair to BJP looking at their 15 year incumbency in some states, their overall performance has been good, particularly Madhya Pradesh where they gave a neck and neck fight to the Congress. But unless BJP government takes some concrete steps to address the problems being faced by the poor, farmers, unemployed, small traders, tribals which are palpable at the ground level, they might have an uphill task to comfortably win 2019. Prime Minister Modi needs to reinvent himself. His style is becoming repetitive and his pointed sarcasm with a touch humour is not resulting in the kind of response it used to do earlier. He is a great orator and still draws huge crowds but the impact he used to make in the run up to 2014 elections is somehow missing. Even Modi’s personal campaign in some areas did not result in a win for the candidate this time round. One of the reasons could be that people are looking for performance not promises. And it is here that they find a glaring mismatch. In building a larger than life character for Modi, BJP seems to have lost touch with the ground. The results of the Assembly elections clearly show that BJP’s star campaigner Modi’s image may be losing its sheen. The Modi-Amit Shah-Yogi combination has not been able pull it off this time. The party has to seriously introspect about their performance and take remedial measures. State after state have been won by strategist Amit Shah who would brook no failure. From the top to the bottom whether it is social media platforms, booth level organization, the entire network of the cadre based party like BJP was prepared by Shah to keenly contest and win elections. Amit Shah seems to have mastered this art as seen during the last few years. Therefore, this kind of a major defeat coming the BJP’s way will put serious question marks on the skill of the strategist Amit Shah. He may have to completely re-think his methodology particularly with looming 2019 elections. Congress has also changed its style of functioning by projecting number of leaders both local and central rather than one leader Rahul Gandhi. Rahul Gandhi who was being derided as “Pappu” as a total novice in the game of politics, seems now to be having the last laugh. While BJP is laughing at him, he is winning elections under BJP’s nose. BJP cannot ignore him any longer. 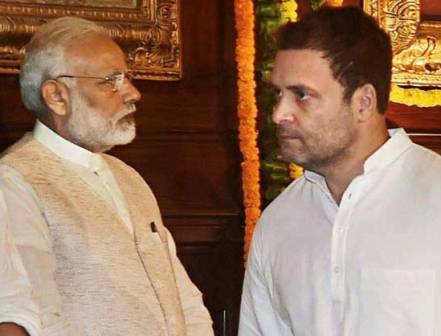 Interestingly it is the BJP leaders’ continuous reference to Rahul Gandhi and his actions during their speeches kept the public focus on Rahul Gandhi making him a natural challenger to Mr Modi. Rahul Gandhi’s style has also changed; he seems to be more modest and humble. His innocence and immaturity seem to be his greatest strength in front of the arrogant style of his Opponents. Trying to beat the BJP at its own game, Rahul Gandh in recent days flaunted his Hindu image. Congress’s soft Hindutva line while still maintaining secular credentials may have widened their base and cut into the so called BJP’s core vote bank. BJP too had carried out a similar exercise by wooing Muslim women with Triple Talaq. For Modi the present set of defeats may not be the last because incumbency factor is present in many other states too. Well meaning Modi government seems to have somehow lost itself in the statistics of projects and programmes. All the good work done comes to naught if at the ground level there are price rise, unemployment and urban and rural distress. On the issue of black money, price rise and unemployment, whatever the government has done is not palpable at the ground level. These were the issues on which promises were made by none other than Mr Modi himself. Polarization, hate speeches seem also not to be working anymore on the electorate. Economic issues and development issues seem to be more of a concern for the common masses. These are the areas where all political parties need to focus on. Large crowds at election rallies are no indication today that people are with you. Today it is Perform or Perish.